Living room with oak floors, big windows, and stepped archway to the entry. This room also leads into the hallway, and opens into the dining room. Distinctive curving glass block entry brings light and character to the front of the home. Turn the key and you are home. That's what we feel when stepping inside, a definite sense of warmth and hominess. It’s hard to find a cozier spot than this single-level with its solid hardwood floors, big windows, and a perfect backyard patio. Despite its fairly small size and relative simplicity, there's so much character from the moment you open the door. Notice the stepped archway between the living and dining room echoed in the smaller arch at the entry. And you can't miss the light glowing through the curved glass block window beside the front door. The circular floor plan creates flow and a sense of space unusual in a 2 bedroom home. Other features, like the large hall, air conditioning, and the laundry/mudroom with pantry shelves off the kitchen, bring convenience and function. The location just makes it sweeter; it's less than a mile to the heart of Proctor for shops, the library, the Proctor Farmers' Market, taproom, wine bars, groceries at Metropolitan Market, and cafes. Not to mention a quick walk through the park for some Valhalla Coffee in the mornings (tied for my favorite coffee in Tacoma!). With a freshly painted exterior and a detached garage on the paved alley, this home is not to be missed. 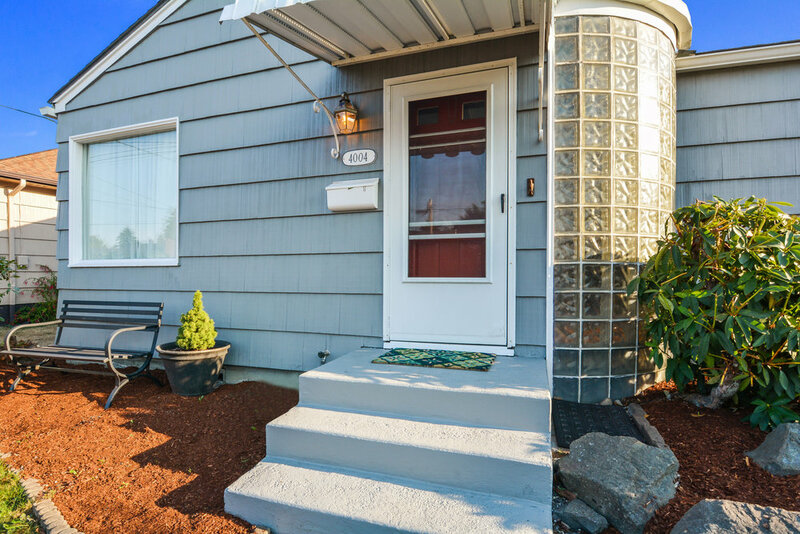 Continue on for the video tour, photos, neighborhood highlights (including walking time/distance to a list of Tacoma favorites), and many more details about this home. Tile floor and counters, wainscot, box window, and lots of little vintage details. A view of the fully fenced and beautifully landscaped back yard with its paved patio, fruiting cherry tree, and detached garage on the paved alley. Looking into the living room from the hall. Solid oak floors, air conditioning, nice light, and a floor plan with good flow! View from the front entry into the living room and through the arched opening into the dining room beyond. Comfortable and cozy. A living room is the heart of the home and this one lives up to its name. This room is defined by large windows, oak floors, distinctive stepped arches from the entry into the living space, and from the living room into the dining area. Details like that show the care that went into designing the home, and this care and quality are felt. Add some area rugs and get cozy. Another view of the living room with oak floors, big windows, and stepped archway to the entry. This room also leads into the hallway, and opens into the dining room. Hang curtains for more privacy, or pull them aside to let in lots of light! View through the dining room to the living room from the doorway to the kitchen. 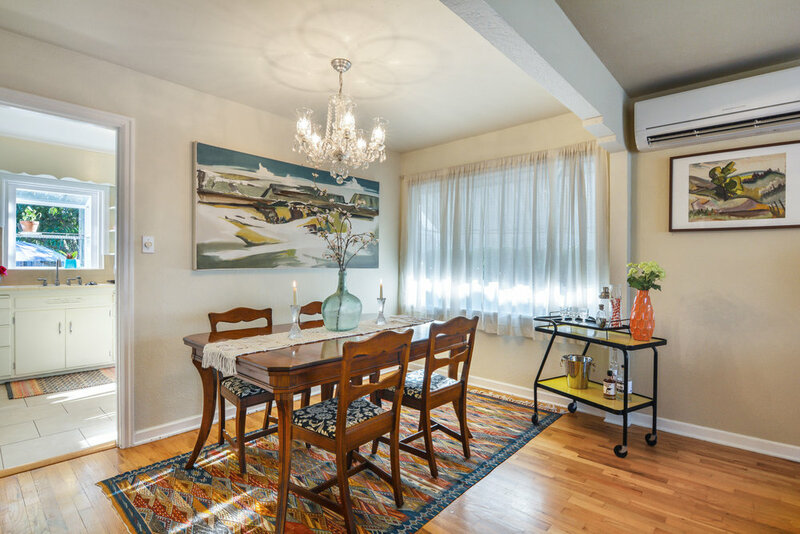 With a lovely flow from the the living room, and easy access to the kitchen, this dining room is perfectly situated. 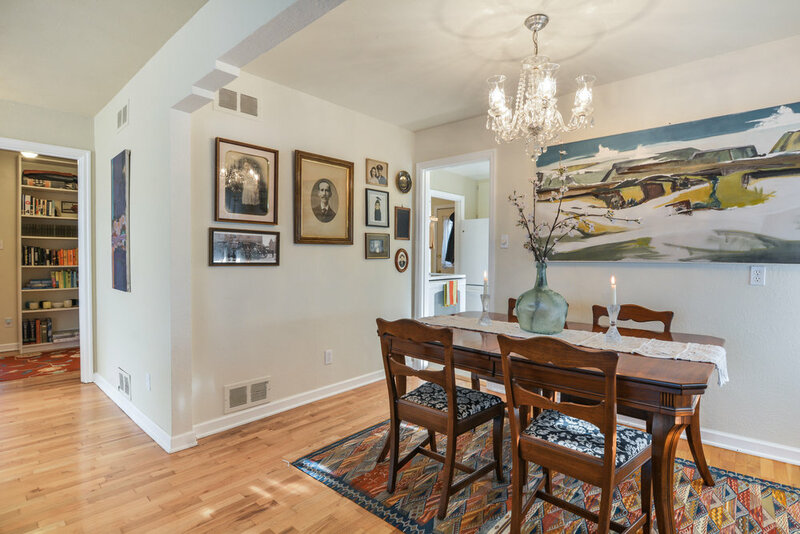 Vintage light fixtures and those beautiful oak floors complete this space that is easily dressed up for company, or kept simple for everyday dinners. The dining room is open to the kitchen, but has its own sense of space defined by the stepped arch above. The kitchen overlooks the back yard and features a box window for herbs and houseplants. I love the curved display shelves beside the window! A kitchen island is a must with its extra shelves and a nice spot to pull up some stools for breakfast or a chat with the cook. Bright, airy, and plant friendly with that cute box window (for all your herbs and pretty potted greenery), this kitchen is a sweet spot. It has so much vintage flair with its hardware, white cabinets, wainscot, and curved display shelves. Tile countertops and backsplash continue the charm. The kitchen island with its additional storage shelves and spot to pull up a stool and eat (or chat with the cook) is a perfect way to round out the use of space. Just outside the kitchen you'll notice the laundry room. There's also a good set of pantry shelves in there for all your canned goods, cereals, pasta, and other goodies. Tile floor, wainscot, white cabinets, hardware, and tiled countertops and backsplash give this kitchen vintage flair. One of two bedrooms. Oak floors, big windows, calm colors. The second of two bedrooms. This one also features hardwood floors, corner windows, and nice trim. The current homeowners have remarked on how spacious the home feels for being a small house. That feeling continues in the bedrooms. These are found in the hall with the bathroom situated between them. 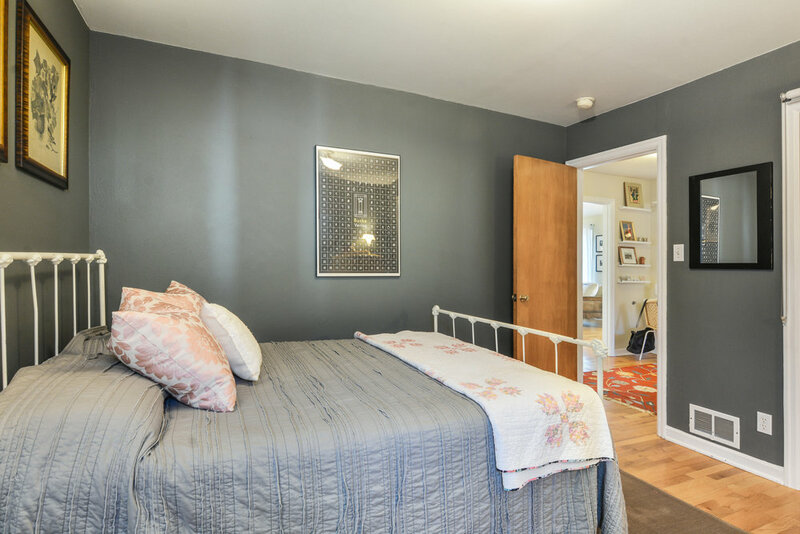 Both bedrooms have good window light, calm colors, oak floors, and a nice amount of space. Simple rooms with a good amount of space, all kept comfortable in this air conditioned home. Another view of the second bedroom looking out into the hall and the living room beyond. A spacious hallway connects the living room to the bedrooms and bathroom. This hall also leads into the laundry/mudroom which opens into the kitchen, and has a door to the backyard. This cute hall is the connector! It's just a hallway, but it gets its own section because it's so ideal with its bookshelves and for the function it performs in the layout of the home. There are no dead-ends here. From the living room enter this hall and head straight into the bathroom, turn left for one bedroom, right for another, or take a right to step into the laundry/mudroom which in turn leads into the kitchen, or out to the back yard. This circular flow keeps any part of the home from feeling cramped. Get creative in here and set up a little desk, stock the shelves with books and favorite objects. The full bathroom is located between the two bedrooms in a spacious hall. Tile floor, easy to clean tub surround, white wainscot, and cool color scheme. This is a one bathroom home, and this one has all you need. Tub and shower, white wainscot and window, a neutral tile floor, vanity, and cool colors. Simple, nice, and clean. A room of convenience! This is laundry room, pantry, and mudroom all combined. It leads into the hall, into the kitchen, and out to the back yard. With additional cabinets, pantry shelves, and a utility sink, this room provides helpful storage and function to the home. Are you starting to get a sense of how this home fits together? We're in the laundry room, mudroom, pantry area now. Tile floor, utility sink, wire shelves for pantry items, linens, or extra dishes, and a good set of additional cabinets for storing cleaning products and other odds and ends from around the house. The room opens into the kitchen and also into the hallway where you found the bedrooms and bathroom. This is also where the backyard access is, so put some laundry in and head out back to relax on the patio. Lawn space, landscaped beds, and pretty trees surround the paved patio in this fully fenced backyard. Set up a picnic table, outdoor loungers, and a bbq, but don't forget the umbrella! This yard is defined by curved pathways, garden beds, a rounded patio, green spaces to stretch your legs, and beautiful trees. There's a fruiting cherry as well as a smoke tree in the fully fenced back yard, and you'll see rhododendrons and a Japanese maple in the front. Bulbs are hiding under the ground cover, so keep an eye out for those in the spring. The patio is calling for your picnic table and pretty umbrella. There's so much texture and shape and color and green out here! The detached garage opens onto a paved alley, truly a nice feature in itself. A view of the fully fenced and beautifully landscaped back yard with its patio, paved pathways, fruiting cherry tree, lawn space, smoke tree, and detached garage on the paved alley. From the back of the fenced yard looking into the cherry tree, side of the garage, and toward the back of the house. Cedar shake siding, yard and garden space in front and back, single-level living, located between the Proctor Business District, UPS, and Jefferson Park. A closer look at the fresh paint, front porch and curved glass block entry at 4004 N 12th. Walk to the Proctor Farmers' Market in under 20 minutes! This home is settled in a solid residential neighborhood with architectural variety, blooming gardens, and easy access to a lovely park. The neighborhood itself is nestled between the Proctor Business District to the north, University of Puget Sound to the east, and Jefferson Park to the south. If you already know Tacoma, you're familiar with these spots and know you're in the sweet spot. If you're just getting to know our city, it's time to explore! 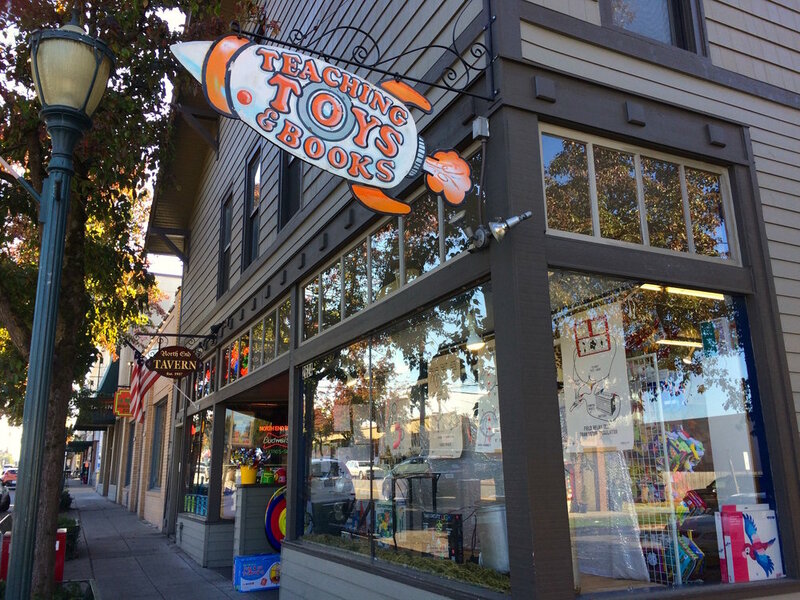 It's less than a mile to Teaching Toys & Books where the shelves are curated with wonderful books and high quality toys for your favorite little ones. The Proctor Mercantile is one of the neighborhood's locally owned shops with gifts for babies, friends, home, and probably something for you too. Living in the Proctor District is like living in a small town within a city. You have everything you need within walking distance, so it's a favorite place for us to park the car, get out those tote bags, and do errands on foot. Inevitably, we mix in some fun with the to-do list, it's hard not to when there are beautiful shops like Teaching Toys & Books (this is the first stop every time we're looking for good books and quality toys for nieces, nephew, baby showers, or birthdays), Compass Rose, The Proctor Mercantile, The Pacific Northwest Shop, and Lapis (yes, this is also most definitely worth a visit if you like to look at beautiful things, or if you're getting engaged, or having an anniversary, or you just love to see handcrafted jewelry in all its glory - they're friendly too!). And it just makes sense to check out Megs & Mo Upscale Resale; you never know! This is just the beginning of Proctor. Don't miss the weekly Saturday La Paloma markets featuring vintage and handmade goods. Treasures galore! Have You Been to the Proctor Mercantile? Don't miss our "From Home on Foot" section below listing the distance in minutes and miles from the door of 4004 N 12th to Tacoma destinations. Fair warning: if you move here, you will start to eat The Cookie more often. For more information about this Proctor area home, call or text me at 253-226-2787. I'll be happy to answer your questions about this home or the Tacoma real estate market in general. Come see it all in person at this weekend's Open House, Saturday, September 1st from 11 am - 1 pm. Good luck on your search and may you find the right home for you!